Chicago granite and marble are both great choices for natural stone countertops. Their unique color patterns, hues and textures are sure to add beauty and character to your living space. Before selecting your countertop, it is important to understand the pros and cons of both so you can choose the right stone for your project. Let’s start with the pros of granite and marble. Both granite and marble are classified as a natural stone which means they are as you would find them in nature. Their natural beauty and one-of-a-kind color patterns are what make them so desirable. The beauty of natural stone is simply unmatched by manmade materials. They are both incredibly durable and heat-resistant making them an excellent choice for a working surface such as a countertop. Granite is naturally harder than marble so it is better suited for areas that will be exposed to most wear and tear such as kitchens and bar tops. The elegance, beauty, and durability of granite and marble will add lasting value to your home. Although there are not many cons when it comes to natural stone, it is important to understand them so you can enjoy your granite and marble countertops for many years to come. Both granite and marble have advantages over other materials such as their beauty and durability – however, they do require quite a significant amount of care in order to preserve their natural beauty. Due to the fact that granite and marble are both porous, it is important to adhere to the recommended cleaning and maintenance instructions in order to avoid staining. Sealing the surface, every 1-2 years is recommended for lasting durability. Many of the cleaning products people are familiar with can cause damage to the sealant. When cleaning the surface you must be very careful not to use any chemicals that will degrade the sealant. If recommended cleaning and maintenance instructions are not followed, damage the stone will ultimately occur. Granite and marble can also be quite expensive, especially when tailored to your style if a custom order is needed. Set a budget to avoid extra costs that can add up quickly. 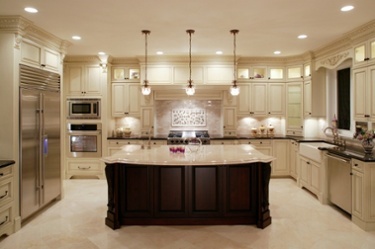 Whether you choose granite or marble countertops in Chicago, you will be happy with your choice for many years to come. Both are naturally made and aesthetically beautiful as well as durable and long-lasting. 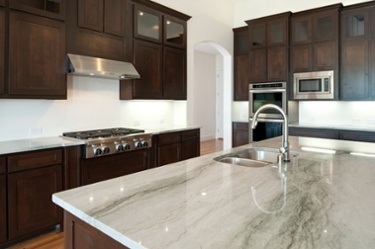 At Granite Selection, we carry the highest quality granite and marble at the most affordable prices. We recommend speaking with an interior designer or with one of our Granite Selection experts to make sure you choose the right stone according to your budget, style, and lifestyle. Many homeowners have not set a budget or have gone over their desired budget by not having an expert walk them through the granite and marble process. Don’t make this mistake – play around with our new Instant Quote tool to set a realistic budget for your dream kitchen. A Granite Selection specialist will only show you stones that meet your budget and lifestyle needs and nothing out of your price range unless requested by you. Once you make your final decision on a stone after weighing the pros and cons of each, you will not regret your decision. Whether you are building your dream home, remodeling a beloved room, or expanding your current residence, the team at Granite Selection is ready to bring your vision to life. Get started today by scheduling free measurements and a project estimate with one of our team members and visit our website for our latest specials.